The temperatures are falling right along with the leaves, and all those autumnal traditions and festivities are just around the corner. Whether it’s picking apples and drinking cider, having fun on a hayride, walking amongst the colorful trees, or even playing in the pumpkin patch, your fall fun will very likely involve food. This is the time of year when leaves are supposed to turn a different color and fall to the ground. But humans? Not so much. Stop Foodborne Illness, the national nonprofit representing individuals and families in the fight against foodborne pathogens, wants to make sure you can fully enjoy this beautiful time of the year. So, here are some ideas for keeping your loved ones and your food safe. · Wash your hands, before and after! Are you petting animals, riding rides at the fair, using “the facilities”, changing diapers, eating corndogs, or any one of a million other actions? Remember: Washing your hands is like a do-it-yourself vaccine [SR1] to avoid getting sick. · Store perishable foods in a cooler or insulated bag. When transporting food that needs to stay cold, place it in a cooler or insulated bag, with a cold source such as ice or commercial freezing gels. Avoid putting ready-to-eat foods in direct contact with ice. · Keep perishable ready-to-eat foods chilled right up until serving time. Cold foods need to be kept at a temperature of 40 °F or below. Organize your cooler contents (keeping beverages in one cooler and perishable foods in another) and reduce the number of times the cooler is opened. Remember: A full cooler maintains its cold temps longer than a partially-filled cooler. · Keep foods to be cooked, separated and chilled until it time to cook them. If the day is warm, as much as is possible, avoid keeping the cooler in the hot trunk of the car. Remember: Keeping raw meats and poultry (and their juices) separate from other foods avoids the potential for cross-contamination. Use dedicated dishes to keep raw meat separate from cooked meat. Raw meats should be cooked as soon as possible after transporting. · When it’s time to cook, have your thermometer ready. Thermometers are easy to transport and use. Remember: For cooked foods to be safe, they must reach a safe internal temperature[SR2] . · How long have we been eating? Remember the Two-Hour Rule: Food cannot be out (at air temperature) for more than two hours; one hour if it’s hotter than 90 °F outside. Throw out any perishable leftovers. Your local farmers market is the perfect place to enjoy sweater weather and buy local produce. Remember: All food, whether it’s from a local farm or a chain supermarket, needs to be washed and handled safely. • If you’re buying meat or dairy be sure it is kept chilled in a refrigerator (or closed cooler filled with ice) to keep the temperature sufficiently cold (40°F or below). Meat and poultry that is exposed or unpackaged, or not refrigerated, should not be purchased. · Be extra safe and consider these questions and tips [SR3] for having the best experience at the outdoor market. · Pathogens don’t discriminate: No matter if the farm is large or small, and no matter if the foods are organically or conventionally produced, pathogens could still be present. • To reduce the likelihood of cross-contamination, keep raw meats and poultry away from other cold foods and beverages by using separate coolers or insulated bags for transport. If it’s hot out, avoid putting food in the (even hotter) trunk of the car. • Avoid the “temperature danger zone” 40°F - 140°F (where bacteria quickly grow to harmful levels) by keeping raw meats and poultry in a cooler with ice. • Make 2 batches of sauce: one for marinade (raw meat) and one for basting (cooked meat). Always marinade in the fridge, not the counter. Set aside a portion to be used later, on fully cooked meat. • Use separate utensils and dishes for raw and cooked food. • Remember: You’re cooking for people you care about, so don’t guess on doneness by color or time – use a meat thermometer and be sure. Whether you’re picking, bobbing, pressing, or caramelizing, apples are the perfect fruit for a fully fabulous fall afternoon. 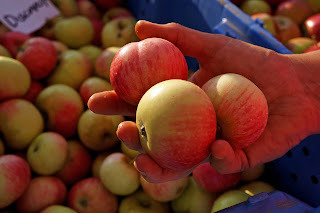 · Thoroughly wash your apples with clean drinking water to prevent any contamination (of course, wash your hands before coming in contact with any food). · Before drinking cider (or juice) at the orchard, or purchasing a jug to take home, make sure it is pasteurized. Pasteurization kills harmful bacteria, such as Listeria or Salmonella, without reducing the nutritional value. Unpasteurized (or raw) products pose a dangerous risk[SR4] , especially to those with immature or suppressed immune systems. · Pick the apples off the tree, not the ground. Any fruit laying on the ground is more susceptible to picking up pathogens, and other undesirable toxins. Eating apples from off the ground is not recommended unless they are thoroughly cleaned and cooked. · Wash your hands. Like mom, we say it a lot, because it’s so important. Washing hands before and after you eat is one of the best ways to prevent foodborne illness, as well as colds and flu. · Dry your hands with a paper towel. With many hands in the kitchen during holidays, and other busy times with lots of people -- after washing your hands, dry them off with a fresh, individual-use paper towel to avoid a more than likely germ-laden communal hand towel. · Clean your kitchen and workspace. Cooking at home can be a fun family activity, but before the fun begins your counters and cutting boards (where bacteria lie the most) need to be cleaned and disinfected. Hot soapy water and disinfectant[SR5] can usually do the job. · Wash produce. All produce, every time. (But wash your hands first.) Before eating or preparing fruits and vegetables wash them thoroughly under running water. Produce that is peeled or sliced also needs to be washed. Firm produce can be scrubbed with a clean, dedicated brush. · Baking cookies makes for indoor fun on a chilly afternoon! Though it’s tempting, don’t eat raw cookie dough [SR8] – both raw eggs and flour have been implicated in recent outbreaks. Find a recipe for safe cookie dough[SR9] here. · If you’re using reusable goodie bags or buckets, be sure they are washed and clean to begin. · The Centers for Disease Control and Prevention recommends[SR10] eating only factory-wrapped treats, and avoiding homemade treats made by strangers, since there is no way to know how they were prepared. · Eat something before going out, so you don’t have to fight (and lose) the snacking urge. It is always tempting to enjoy a piece—or ten— of the sweet haul while walking house to house. Stop Foodborne Illness urges trick-or-treaters to wait until they return home where they can examine all treats for choking hazards and tampering before eating them. · Wash your hands. Between trick-or-treating and school parties, packaged candy passes through a lot of different hands increasing the likeliness of their being covered in germs. Are your kids washing up before chowing down? Staying safe takes about 30 seconds. · Make sure natural treats are safe, not spooky. That means, drinking and/or serving only pasteurized cider and juice at your parties. Dishes or drinks with fresh fruit – or veggies – must be thoroughly washed before being served. · Keep all perishable foods chilled until serving time. And once served, don’t leave goodies —like finger sandwiches, cheese platters, fruit, salads, cold pasta dishes, Jell-O treats, store-bought deli trays, and cream pies or cakes with whipped cream and cream cheese frostings—out of the fridge for more than two hours (1 hour in temperatures above 90°F). Bacteria creeps up when foods sit out too long. · Bobbing for apples is a classic Halloween game, but having multiple people sticking their faces in the same water, trying to grab the same apples with their mouths can present some food safety risks. Reduce the risks by giving each participant their own thoroughly washed apple to bob for in a separate bowl.